The second step — buying advertising — is equivalent to buying an ad in the phonebook. Versus the phonebook, you'll get more reach and better tracking data, which helps ensure you maximize your local advertising ROI. Yelp provides business owners that have “unlocked” their pages with lots of value-added features including messaging options (eg., post offers and announcements, reply to reviewers) and stats on how many people have viewed your business page. Check out this page for a screenshot of the business dashboard you'll have access to as the owner of the business. The biggest benefit of taking control of your Yelp page is being able to highlight positive reviews of your business and/or responding to reviewers privately. However, don't think that just because Yelp is willing to take your money that it means they will take down negative reviews of your business. They won't, unless it violates review guidelines (eg., contains racial slurs or is second-hand information). As a good business owner, you should take comfort in this policy, because it means your less scrupulous competitors won't be able to hide their shady practices for long. Showcasing your business on a similar business' page. Adding business details and creating coupons is completely free on Google. Start by claiming your business at Google's Local Business Center. Once you’ve verified your ownership, you can start adding details and creating coupons that will appear on your business details page. Here’s where Google Local become more exciting than the phonebook. On your Google local business dashboard (screenshot), you can see what search phrases people are typing in to find your business and where those searchers are located on a map (abstracted to a zip code level to protect searchers' privacy). 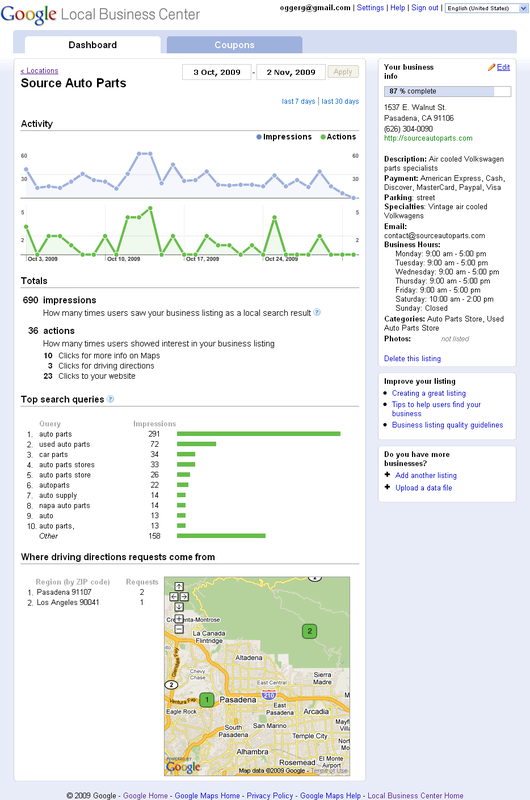 Click here for more information on Google's Local Business Center features. AdWords is the program where advertisers bid on search keywords and have their links appear next to or on top of search results. While the AdWords program is not specifically geared towards a local market, as an advertiser, you can limit where your ad appears based on the searcher's location. You buy AdWords ads by bidding on how much you're willing to pay for clicks on your ad. Your ads appear on search results for your targeted keywords (ie., phrases people type into the search box). The more popular keywords (eg., "thai food") will cost more per click than more obscure keywords (eg., "pad thai"). Balancing the cost per click versus the popularity (reach) of keywords is what makes AdWords advertising a bit tricky. It does take quite a bit of management to maximize your ROI. Fortunately, Google allows you to set spending limits so you don't blow your monthly budget, and offers plenty of tools and resources to help you manage your AdWords campaigns. The difference between Local Ad Listings and AdWords is that you don't have to bid for keywords or do any fancy campaign management. Google charges a flat monthly rate for these ads, and shows them on local searches at the top of search results (screenshot) and in Google Maps (screenshot). 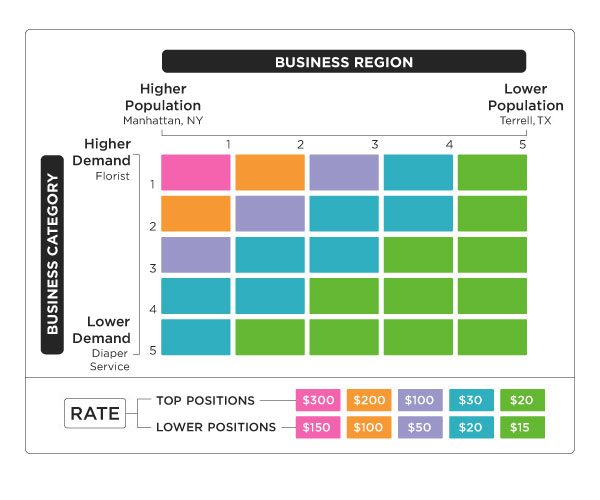 The rate depends on your city and business category. Rates are offered after you've claimed your small business listing in step 1. Once you've claimed your local business and Google has rolled out these ads to your city, you will see a new "Ads" tab in your business dashboard. An advantage of the Local Ad Listing — in addition to having your business appear prominently on related searches — is the call tracking. When someone calls the phone number listed on your Local Ad Listing, the call is forwarded to regular phone number, and when you pick up, you will hear a short "this call is from Google" message. Counting up the number of calls you receive from your local Google ad, you can then determine if the monthly fee is worth the number of new leads you receive. The first step is to create a Yahoo login. If you already have a Yahoo email address, you can use that login account to manage your local business listing. If you already have a Yahoo account, login to your account. If you don't already have one, you can sign up for a Yahoo account here (it's free). Start by doing a search for your business at Yahoo Local. If your business already has a listing, click on the "edit info" link on the details page. Your business will then be linked to your Yahoo account, and when you go to listings.local.yahoo.com, you can click on the "Local Listings Account Center" link in the upper right hand corner to see all your business listings. If your business is not yet listed, go to listings.local.yahoo.com and click on the "Sign Up" button. You will be presented with a form to fill out your business details like address, phone number, service description, and hours of operation. At the very least, make sure your local small business is listed at all three sites. It will cost you nothing but a little time, and you will reach the majority of people searching online for a local service. When you are ready to spend a little money (say, less than $100 per month) on increasing your local exposure, the best bang for your buck will be Google AdWords (step 2A in the Google section above). Using AdWords, you can set a low spending limit and get your feet wet with online advertising. For a budget of more than $100 per month, consider getting both the Yahoo Enhanced Listing, buying advertising on Yelp, and (if available in your area) getting a Google Local Ad Listing. Even though the Yahoo Enhanced listing will only cost $9.95 per month, I wouldn't advise spending that money until you've spent some money on AdWords because (a) the Enhanced Listing only provides the same features and stats as a free Yelp or Google listing, and (b) Yahoo Local searches don't reach as many people as Yelp or Google. A final word: keep track of where your leads are coming from to maximize your local advertising budget. Spend your money on the site/campaign that produces the lowest cost per lead.